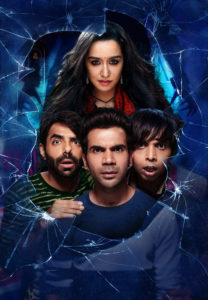 A defiled love, a broken heart and ghostly love are the major components of the new film Stree releasing 31st August starring Shraddha Kapoor and Rajkumar Rao. Horror comedy is a new genre for Bollywood cinema but one that is not unknown in the south film industries with hit films like the Pizza franchise or Darling. The production team of Maddock films and D2RFilms have brought Sachin-Jigar in to give this film a recognisable element, namely in its soundtrack. They have delivered a very short 4 song album each about 3 minutes to give the audience something to hold onto as they go on this wild ride towards an unknown and suspenseful ending. The album opens with a dance number Milegi Milegi. This is Mika Singh. Its loud, its dance but also folk feel as there are no club beats introduced. Sachin-Jigar come in on the mic as both chorus and random background noises to give it a feel of street authenticity. Harmonium and tabla are used but for the majority its Mika and an electric guitar and a wedding scene. We have the item song next. Kamariya is sung by Aastha Gill and Divya Kumar, with Sachin-Jigar again providing background sounds on the mic. This is the classic cabaret or item song, which manages to avoid a club beat again but finds a hip hop flavour. There are bongo drums, harmonium and low synth sounds in the background which never get above the singers in any way. There is a soft rap break in the middle just to break up the song a bit but otherwise it’s all jhatka and lachka. The third song is the soft love song. Nazar Na Lag Jaaye is a song with Cupid’s arrow pointed directly at the listener’s heart. Ash King delivers a “Baarish” performance and Sachin-Jigar just seem to make it better. Once again they add vocals, but also there is finger clicking and an air rushing sound effect that refuses to die down. The song threatens to take off several times but somehow holds its line throughout. In doing so however the song is very repetitive and the lyrics being the standard sort of lyrics that anyone can predict, in the end this song is dull. Final song goes to a remix edition of Kamariya: Aao Kabhi Haveli Pe. For a change up Baadshah is involved in this, but there are no actual changes to the tune or instruments itself. The video clip available on YouTube does give us a surprise cameo from Kriti Sanon and she again shows off her dancing skills but else this is the same old, same old. With such a short album with punchy songs, the music doesn’t really get a chance to flourish. Thus it’s best if it’s loud, fast and hits the listener in the face. While Milegi Milegi does the job required here, the rest of the songs only serve as speed breakers within the story. As songs, they don’t really stand out on their own either as they aren’t long enough to have any impact on a listener’s memory. Thus, it’s very hard to rate this album highly. However, since they do complete the job within the film and Mika is just so good at short and punchy, it can’t get a bad rating either. 15 queries in 0.456 seconds.